Qiang Zhang’s subject Yang Li was a famous actor in China. Since migrating to Australia, he has played a supporting role in the film Mao’s last dancer and appeared in various television programs. 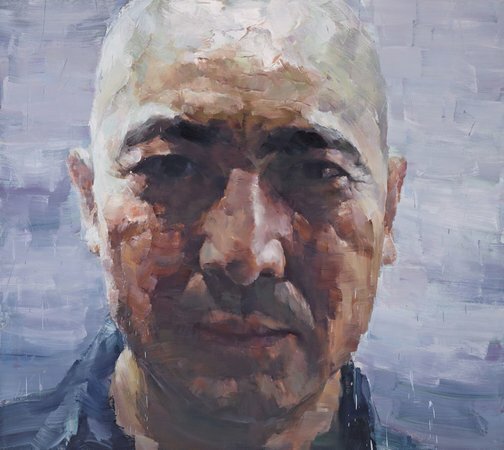 ‘This year, when I was once again faced with the question of where I would find my sitter, one of my friends joked and said that I should paint Yang Li,’ says Zhang. ‘It was just a joke at the time but the more I thought about it, the more I liked the idea. For starters he was bald. Strange as that may sound, for an artist who is more impressionist than detailed in my style, it meant that instead of being limited to only a few shades to articulate the intricate strands of hair, I had to freedom to use a greater spectrum of colours to capture the lighting reflected on a bald head. Born in Dalian, China in 1962, Zhang graduated from the Luxun Academy of Fine Arts in Shenyang. He migrated to Australia in 1990 and set aside his passion for painting for a decade in order to care for his family. Since beginning to paint again he has been a finalist in the Wynne, Doug Moran and Black Swan Prizes.